There is a general feeling in the writing community that you should write about what you know. If I limited myself to that, I'd have very little to say indeed, so I'm kind of stepping off the deep end here and writing about something I know almost nothing about. 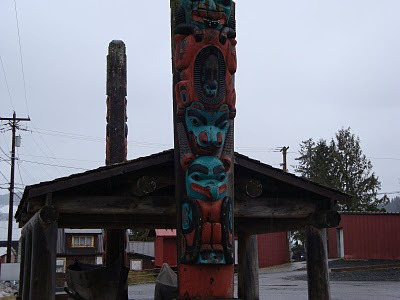 The totem poles shown here are located in the Hoonah City Schools parking lot. I'm not sure how it is that they came to be there, except that it was a large enough public area to house them. I do know that they were carved by Rick and Mick Beasley, twin brothers who have a lot of ability when it comes to the art of carving. I can't really recall when these were put in place. I believe they are probably made out of red cedar, which of course lasts a long time. Several weeks ago I spoke to Gordy Greenwald about the totem poles, but unfortunately, he was either somewhat vague or I've forgotten most of what he told me. I suspect the latter. Gordy taught wood shop here at school and also taught a course in Northwest coast art. I think all of my kids made paddles and several of the girls were really talented with the designs. He also taught the kids how to make bentwood boxes. That entailed taking a lenght of board, I think cedar was preferred, and scoring the back of it about half the thickness of the board in three places an equal distance apart. Then the wood was soaked or steamed until it softened up enough to bend into the shape of a box. A top and bottom were fashioned for it and then it was decorated. The natives used the boxes to store their belongings. It was really quite ingenious. If I remember correctly, he said that the colors shown here were the predominant colors that the natives used. Apparently they ground up different minerals to get the red and black pigment, but I believe he said they had to get the bluegreen from somewhere down in the southern end of the state- someplace where there was copper. Maybe it was from up north. Anyway, they couldn't get what they needed from around here. 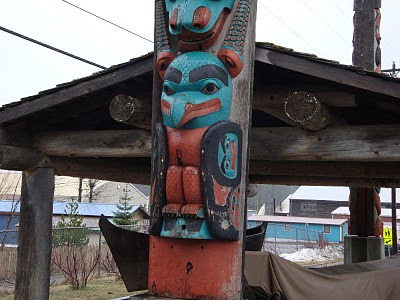 From what I could gather from Gordy, each carver used to the totems to tell a story- perhaps about a fishing or hunting experience or family history- I'm not really sure. I believe that the missionaries used to think that the natives worshipped the totem poles, but it's my understanding that it wasn't the case. The poles stand at either end of a shelter that houses two canoes. These canoes are similar to what the Tlingit used to get around all over the coast. Gordy was saying that the natives ranged far and wide in these dug out boats. He said one native gal in Kake whose husband was killed by the U.S. Navy back in the 1800's took one clear down to Puget Sound to extract revenge on a naval officer. I guess the navy never compensated her for the death, as was the native custom. Apparently she made it all the way down and came back with some naval officer's head. It may not have been the guy responsible, but he fit the bill because he was in the navy. At least that's the story I heard. I had read about another incident involving the U.S. Navy and the native village of Angoon. It was another situation where someone in the village had been killed whether by accident or not, and wasn't compensated, so the villagers kidnapped some sailors. If I remember correctly the navy bombarded the village and killed quite a number of people. Needless to say, the clash of the cultures has left a number of the natives with a bitter feeling towards the government. I wish I could tell you what the totems represent. I believe one shows a raven and the other an eagle which were the two moieties. I believe there is a frog shown in the last picture. Unfortunately I couldn't get a good picture that showed in detail all the different figures, but one of the totems clearly shows an octopus also, which of course I wasn't able to capture. 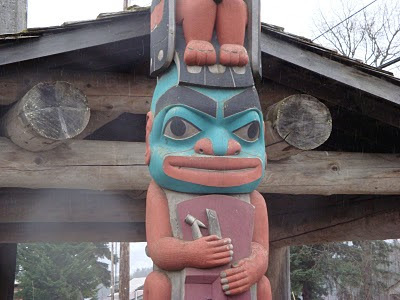 When we first got to town the only place I remember seeing any totem poles at all was on Graveyard Island. I don't know if they were more prevelent before the town burned down in the mid 1940's or not. I believe Ketchikan has quite a number of them and if I remember correctly Gordy said they could be found along the coast from Northern California to Anchorage. I've never spoken to anyone else about the totems. None of the elders that I've talked to have ever mentioned them, so perhaps they didn't have much importance here. I can only speculate, which is never a good idea when you're speaking about someone's culture. In any event they're nice to have here. If I find out more about them, I'll fill you in on a later blog. There's a Pessimist in the Kitchen! As you can see, I have a bowl of macaroni salad on the counter. It may not look like macaroni salad, but it is. It actually looks better in real life- the picture isn't doing it justice. Every now and then I make a bowl of it to go along with the rest of some meal or another. 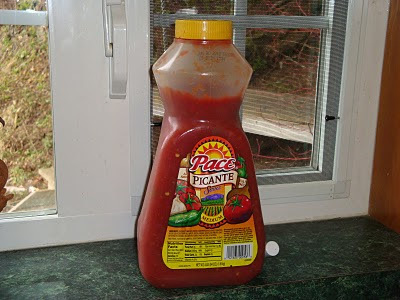 Tonight we're going up to the church for a pot luck, so that's what I'm bringing. A few weeks ago, I was in Hoonah Trading when one of the single fellows who works at the forest service came in and was lamenting the fact that the store didn't carry any cold salads any more, like macaroni or potato salad. I said, "just make your own." Well, apparently he doesn't know how, so I said, "next time I make it,I'll bring you some." So that's what I did. He was all excited and thanked me and even gave me a "God bless you", so I left his office feeling all good about myself. As I was walking home the thought occured to me- what if for some reason he ate it and got sick? There goes my blessing. What if for some unknown reason he didn't realize that I put Best Foods mayo in it and he's allergic to every kind but Kraft, or what if he had a reaction to the eggs or the green pepper? What if the worse case scenario happened and he got food poisoning some how and died? When the coroner opened him and started examining the stomache contents, he would know right away. On the death certificate it would read- Cause of death- Tom Botts. Would I be considered innocent in a court of law or would I be sentenced to life in prison for an innocent mistake? It might even make the national headlines. It might be the lead story on ABC World News Tonight. Diane Sawyer would be looking into the camera all grave and somber and announce, "In the tiny fishing village of Hoonah Alaska, a forest service employee was poisoned by a man pretending to be his friend who offered him some toxic macaroni salad." It might become an issue that the president and congress would like to take up- part of the health care debacle. It would set off a whole new round of regulations from the food and drug administration. All this because I wanted to make a little macaroni salad. What is the world coming to?